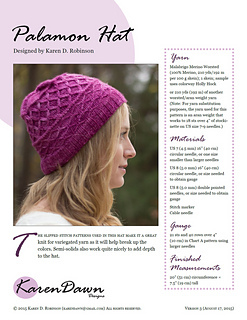 The slipped stitch patterns used in this hat make it a great knit for variegated yarn as it will help break up the color. Semi-solids also work quite nicely. 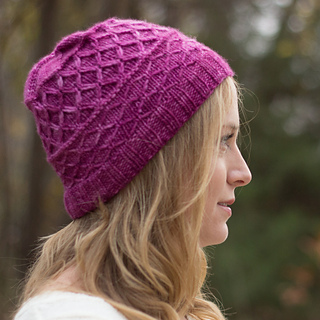 The hat is knit in the round on circular needles in a worsted weight yarn. Pattern includes both written directions as well as charts. 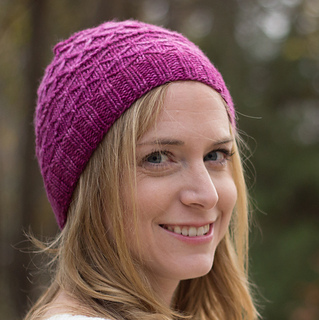 A video tutorial is available for the stitch pattern in Section A. Thank you to my test knitters (ftmhling, rturnbull, helenapower, starburn24, sawyerscience, and Heidi197) and tech editor (kwunder) who provided valuable feedback. Palamon and his cousin Arcite are characters in “The Knight’s Tale,” part of The Canterbury Tales by Geoffrey Chaucer. The cousins have been captured after a battle, and their cell overlooks the gardens. A beautiful young woman named Emelye walks in the gardens, and both cousins fall in love with her. After many years, the cousins fight a duel over Emelye (presided over by their captor, Duke Theseus), and the winner is to claim Emelye’s hand in marriage. Before the battle, everyone prays: Palamon for success in love, Arcite for success in battle, and Emelye to remain unmarried if possible, but if not then to at least marry the man who truly loves her. The gods (Venus, Mars, and Diana, respectively) argue about how to give everyone their wish. So (spoiler alert! ), Arcite wins the battle (by wounding Palamon) but afterwards is thrown from his horse and mortally wounded. With his dying breath, he wishes Palamon and Emelye to marry and be happy. So they all get what they wanted (although really Emelye got her second option). 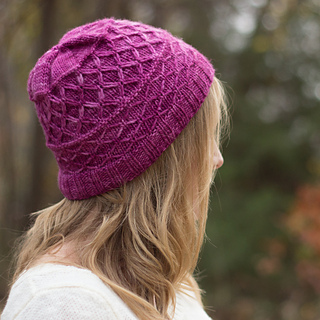 The Arcite Cowl is a companion piece to this hat.